Eunice Emily (Bentson) Tarum, 86, of McPherson, KS passed away peacefully on Friday, April 13, 2018, at Brookdale Memory Care facility in Wichita, KS. She was born on February 25, 1932, in McPherson, KS, the daughter of Frank W. Bentson and Evangeline “Eva” (Burk) Bentson. Eunice graduated from McPherson High School in 1950 and Bethany College in 1954. She was united in marriage to Melvin I. Tarum on June 27, 1954, at Trinity Lutheran Church, McPherson. 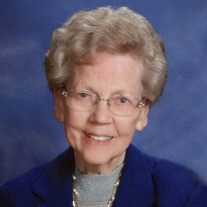 She taught music in McPherson County public schools and also served on the music staff at Trinity Lutheran Church for over 50 years. She was also the Kansas sales representative for the Malmark Handbells for over 25 years. Eunice served the McPherson Community in several capacities: two terms as USD 418 School Board Member, PEO member and officer, McPherson Symphony Orchestra Manager, SAI, KMEA, 4H Leader, Cub Scout Den Mother, and various other music and education organizations. She is preceded in death by her parents, Frank and Eva Bentson, brother, Robert Bentson, and daughter, Julie (Tarum) Tidd. She is survived by husband, Melvin Tarum, and son, Daniel Tarum of McPherson, KS; son-in-law and daughter-in-law, David (Julie) and Laura Tidd of Iola, KS – David and Julie’s children: Joshua (Emily), Joel, Jason, Jonathan, Jennifer, and Jessica Tidd; daughter, Nancy (David) Woodruff of Wichita, KS, and their children, Brandon, Kristin, and Ryan Woodruff. Visitation hours are from 3:00 to 7:00 PM, Thursday, April 19, 2018, at Stockham Family Funeral Home, with the family receiving friends from 5:00 to 7:00 PM. The funeral service will be held at 10:30 AM, Friday, April 20, at Trinity Lutheran Church with The Rev. Tim Leaf officiating, with the burial following at New Gottland Lutheran Church Cemetery, McPherson. Memorial donations may be given to Trinity Lutheran Church, Brookdale Memory Care Facility, or Alzheimer’s Association in care of Stockham Family Funeral Home, 205 North Chestnut, McPherson, KS 67460.